Slavonic Dances op. 46: No. 1 in C major - Presto [3:44], No. 2 in E minor - Allegretto scherzando [4:19], No. 3 in A-flat major - Poco allegro [4:40], No. 4 in F major - Tempo di menuetto [6:22], No. 5 in A major - Allegro vivace [3:33], No. 6 in D major - Allegretto scherzando [5:08], No. 7 in C minor - Allegro assai [3:33], No. 8 in G minor - Presto [4:04]. This is a very fine disc in many ways. Despite that it does beg the question: Who is it aimed at? It should certainly sell well in Belgium and it will fully deserve its success but in the cold light of day the admittedly generous choice of coupling lets it down. The New World can be found with the 8th symphony on a superlative Decca CD with Kertesz and the LSO in great form. The complete Slavonic Dances - Opus 46 and 72 - are well served by Jarvi (Chandos) and Dorati (Mercury). 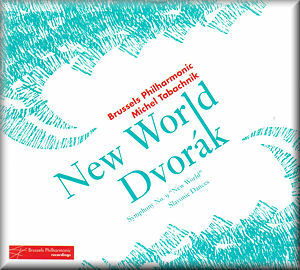 I’m surprised that the Brussels Orchestra didn’t record both sets of Slavonic Dances and issue them on a single CD, leaving the New World to find a more appropriate partner. There’s another fatal blow to the disc’s competitiveness in the overcrowded international market and that is the omission of the exposition repeat in the first movement of the symphony. For some this will be of no major consequence, for me it’s ruinous. That’s most of the negative stuff out of the way. The orchestra plays with great spirit and everything they do is fresh and spontaneous. The first movement of the New World opens rather slowly and solemnly but it soon springs to life. The first theme is really exciting (good horns) and it’s well captured by the engineers. The famous flute melody leaps forward - a bit of artificial highlighting here? - and immediately afterwards the violins shape the melody with great care. The cor anglais in the slow movement may not be to everyone’s taste with its wide vibrato and creamy tone. It may be a wee bit emotionally over the top but at least it offers a new approach. The Molto vivace is dominated by a gorgeous woodwind section that plays beautifully throughout and the Allegro con fuoco certainly has lots of power, fire and momentum. Ensemble isn’t always immaculate; there are a couple of less than perfect patches in the last two movements, especially near the start of the fourth movement where Tabachnik pushes on with an adrenalin rush and the horns and strings go awry for a couple of bars. It’s very bracing though! Michel Tabachnik’s overall view of the symphony is unfussy and it’s full of lovely interpretative touches. It’s obvious that a lot of care and attention to detail has gone into this. The sound is sweet and immediate with a large but comfortable dynamic range. The brass is superb, the timps are too far back and cavernous for my liking - soft sticks were used, maybe - but the strings are forward and glowing. Some noisy bowings are captured here and there amid the first violins but that’s of little consequence. The players are going for it - this is no studio run-through. Had you heard this New World at a live concert you would have been well satisfied but would you go back to it again ahead of Kertesz (Decca), Rowicki (Philips) and Alsop (Naxos)? The answer is probably not. Did I enjoy hearing it? I most certainly did. The Slavonic Dances, clocking in at 33:48 are hardly mere fillers. The Brussels Philharmonic is a fine orchestra and they really shine in the Op. 46 set. They sound as if they are having a great time and are clearly on their toes. What a shame the coupling isn’t Op. 72. That disc would have been a winner. Maybe I’m jumping the gun and the Op. 72 and the 8th symphony are ‘in the can’ for a future release. What we have here is some magnificent playing. It sparkles, has wonderful rhythmic impetus and most telling of all, the music is allowed to relax and speak for itself in the quieter passages. There are some melting, lyrical moments to catch the ear. A super set. The orchestra should be very proud of their achievement. In summary, a good but not market-leading New World coupled with an infectious set of Slavonic Dances naturally recorded in a warm acoustic and directed with flair by Michel Tabachnik. It will be interesting to see what direction the orchestra takes for its future releases. Maybe they could focus on some under-recorded or unrepresented repertoire by its Belgian compatriots.